When Supergirl debut in the fall of 2015, there was a planned love triangle between Kara (Melissa Benoist), James (Mehcad Brooks) and Winn (Jeremy Jordan). Instead they became a team and close friends that carried through the first three seasons of the series. It was learned last week that Jordan would be moving from a series regular to a recurring character for the fourth season and last night during the season finale we learned his characters fate… spoilers ahead. Supergirl — Photo: Katie Yu/The CW — © 2018 The CW Network, LLC. All Rights Reserved. 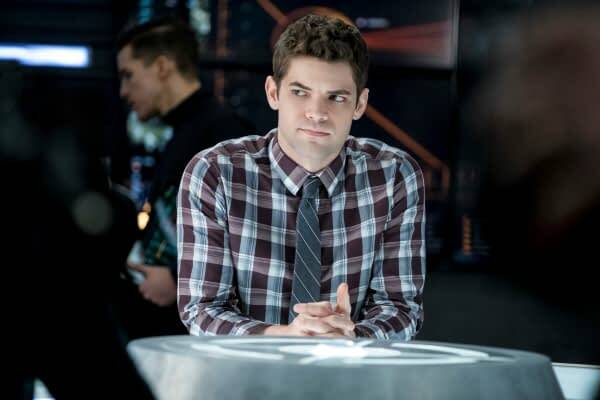 As many of you have heard by now, Winn will no longer be a series regular on Supergirl. However, this is not goodbye. Although you may not see him puttering around the DEO every week, I love everyone in National City too much to stay away forever. Winn WILL return in season 4. Nevertheless, I wanted to say a few words. I came to LA three and a half years ago searching for a new adventure, and in a matter of weeks, I was best friends with a super hero. I mean, come on. It’s been the adventure of a lifetime, and breathing life into that brilliant, quirky, puppy dog nugget named Winn has been a true joy. But lately, my gut has been telling me that I’m once again ready to begin a new chapter in my life… and if I’ve learned anything, it’s that you gotta listen to your gut. So I want to thank everyone ehind the scenes at Supergirl for understanding it was time for me to return home… to spend time with my wife and friends, and focus on crafting the next stage of my career. I also want to thank all the incredible fans of the show for your kindness, humor, patience and most of all, your support. Finally, a special thank you to my Supergirl family. More than anything else, I’m going to miss spending every day with you amazing, beautiful dorks. However, as I have said, this is not goodbye. Your favorite cardigan wearing hobbit has plenty of stories left to tell. See you in the future. Supergirl will be back this fall, Sundays at 8 PM on the CW.